Kristi is the owner of the Occupational, Physical, and Speech therapy counterparts of In Harmony Pediatric Therapy. She graduated from the University of New Hampshire in 2000 with a Bachelor’s degree in Occupational Therapy. She has been practicing in the area of pediatrics since then, both in clinic and home environments. Kristi has special training in feeding, use of Therapeutic Listening, Handwriting without Tears, and Rhythmic Movement Training (RMTi). Although she used to treat more full time, the growing business has turned her focus to managing day to day business decisions, marketing, business development, and making sure families and therapists are happy. Kristi loves owning a clinic and living in Cherokee County, and is excited for what In Harmony will offer in the future. In 2017, Kristi was awarded Enjoy Cherokee Magazine's "Top 10 in 10" in Cherokee County as well as Georgia Trend's "Top 40 Under 40" Recognition. She is also a graduate of Leadership Cherokee Class of 2018. When not working, Kristi enjoys spending time with her family and friends and loves to travel. Karen earned her Bachelor of Health Science degree in Occupational Therapy from Eastern Kentucky University. She has worked in many OT settings, to include home health, outpatient therapy clinics, school-based practice, and hospitals, with a wide array of ages and diagnoses, but her true passion has always been in the pediatric setting. Her pediatric training has mainly focused on Sensory Processing disorders, NDT techniques, Brain Gym movements, primitive reflex integration/ RMT (rhythmic movement training) I and II; , along with the Handwriting Without Tears program. Karen loves working with children and she is so excited to be working at In Harmony Pediatric Therapy. When she is not working, Karen enjoys spending time with her husband and two sons. Karen’s family enjoys spending time outdoors, hiking, riding bikes and traveling. She also loves her ‘girl time’ with her close friends. Laura graduated from the University of Georgia with a Bachelor of Science in Biology and from Shenandoah University with a Master of Science in Occupational Therapy. She has worked exclusively in pediatrics for close to two decades with a specialty in sensory integration and sensory feeding. Laura has worked in a variety of settings to include a children’s hospital, several private practices, a private school, and the public school system. She has participated in a wide array of continuing education over the years to include Therapeutic Listening, Handwriting Without Tears, sensory integration techniques, visual deficits, sensory feeding, and Rhythmic Movement Training. She has enjoyed running a variety of therapeutic groups and camps over the years. Laura loves her husband, her children, Maui, scrapbooking/crafting, organizing anything, reading, and jet skiing. Andrea graduated from Brenau University with a Master’s in Occupational Therapy after earning a BA in Psychology from Armstrong Atlantic State University in Savannah. She has been working in a pediatric outpatient setting gaining experience with a wide range of children with sensory processing disorders, developmental delays, visual and motor deficits, and various syndromes/abnormalities for over 10 years. She has expanded her understanding of visual deficits, reflex integration/movement based learning, and sensory processing through numerous continuing education courses including multiple levels of Rhythmic Movement Training, Therapeutic Listening, and Brain Gym. Andrea enjoys spending time with her husband Chris, sons Asher and Brooks, and her family/friends. She is always looking for a good weekend to camp, place to travel, live music/local art festivals, and after completing a recent sprint triathlon, has her eyes set on conquering an Olympic distance triathlon in the coming years! Cynthia earned her Bachelor of Science degree in Occupational Therapy from the Medical College of Georgia, and also holds a Bachelor of Arts in Journalism from the University of Georgia. Cynthia spent 13 years working at The Shepherd Center in Atlanta, working with traumatic spinal cord and brain injuries. Cynthia has pediatric experience in the school system and with hippotherapy. She has a special interest in working with kids with orthopedic and neurologic impairments, especially in the area of ADLs to increase their daily functional independence! When not working, Cynthia enjoys homeschooling and spending time with her two children, Mary (who loves all things horses) and Russell (who loves all things baseball.) She loves working out, going to the shore, THE BRAVES, and enjoying time with friends. Celina graduated from the University of Delaware with a Bachelor of Science Degree in Human Development and Family Studies. After completing an internship and a study abroad program at a facility in South Africa, Celina knew that she wanted to become an Occupational Therapist. She attended Mercy College in NY and realized her dream by graduating with a Master’s in Occupational Therapy. Celina loves working with children of all ages and all abilities. She continues to learn and expand her knowledge of primitive reflex integration and sensory processing through continuing education courses including Brain Gym and Rhythmic Movement Training (RMT I and II). When Celina is not working, she enjoys spending time with her college sweetheart husband, Rob, their son Cannon, family and friends. Naeha earned her bachelor’s degree in Psychology from the University of Georgia followed by her Masters in Occupational Therapy from the Medical University of South Carolina. She has been in pediatric settings working with children with sensory processing issues, autism, and developmental delays. She is expanding her knowledge into reflex integration and rhythmic movement training. When she’s not working, Naeha loves to spend her time with her husband traveling and exploring new cities, going to the beach, hiking, and spending time with friends and family. Jill began her career working with children with special needs as an elementary school special education teacher. After nine years in the classroom, Jill returned to school to pursue a degree in occupational therapy, and has worked as a pediatric OT for the past 20 years. 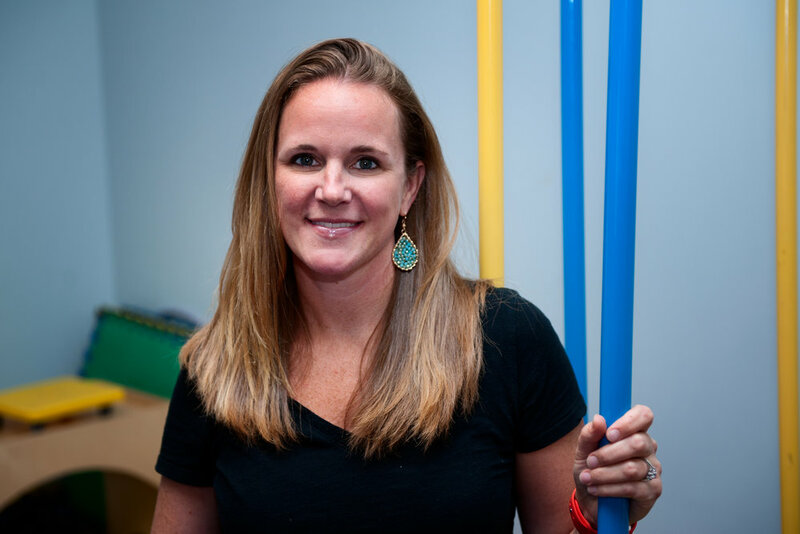 Jill’s extensive resume includes over 25 workshops on topics such as sensory modulation, feeding, motor planning and praxis, visual perception/visual motor skills, reflex integration, vestibular rehabilitation and vision/attention issues. She is a trained provider of Therapeutic Listening and iLS (Integrated Listening System) as well as trained in SOS techniques. Jill has experience working with children with feeding issues including children with autism or anxiety. She enjoys treating children with visual issues who may be demonstrating difficulty with academic or motor tasks due to poor coordination of their eyes. Siobhan earned her Master’s in Occupational Therapy from Quinnipiac University in CT. She has worked in a variety of pediatric settings including Children’s Healthcare of Atlanta, multiple outpatient clinics, hippotherapy, and the public school system. Siobhan has experience treating children with sensory processing disorder, Autism, developmental delays, neurological impairments, and orthopedic injuries. Siobhan loves working with children of all ages and is so excited to be working at In Harmony. When she is not working, Siobhan enjoys spending time with her husband and their two agility-trained dogs. Siobhan loves being outdoors, traveling, and spending time with friends and family.